Inscription – Constructed in 1890-92, the Equitable building is on the National Register of Historic Places. It has long been home to many of Denver’s most prestigious law firms and financial institutions, and is generally regarded as the last great building constructed in Denver before the Silver Panic of 1893. At the time it was built, it was the largest and most stately building in the city with nine stories, complex massing and details such as the cherubs mid-way up its fa?ade. Its elegance and distinction continue to make it one of Denvers premiere buildings. Details – There was joy and hoopla when it was announced that the Equitable Life Assurance Society of New York would erect Denver’s first office tower. From the citys earliest days, many believed that Denver was destined to be the commercial hub of the Rocky Mountain region. The vision Colorado Senator Edward O. Wolcott helped make it so. During the 1870s, Wolcottt served on the board of directors for the Equitable Life Assurance Society in New York. He advised Equitable president Henry Hyde on mining investments. 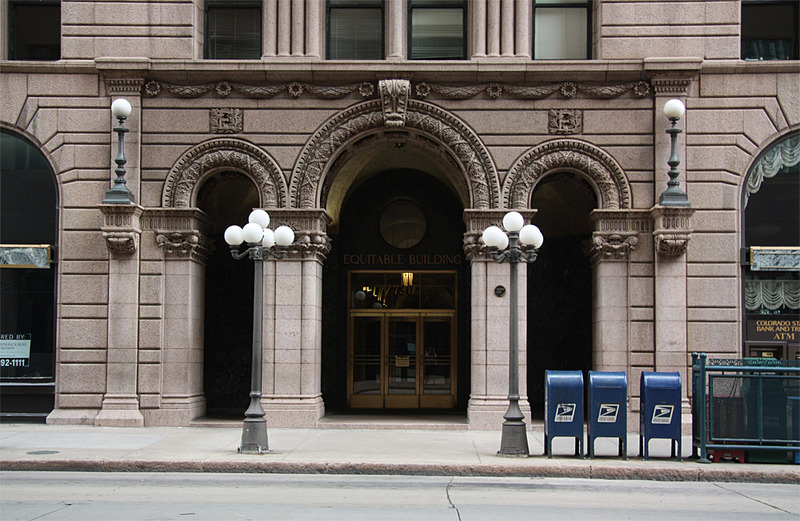 Wolcott was instrumental in making Denver the headquarters for the Equitable Life Assurance Company in the Rocky Mountain region. Wolcott’s triumph was heralded as a turning point for the Mile High City. The Denver Republic newspaper proclaimed, “With this great investment here, the capitalists of the East will feel confident in the stability of Denver’s growth. The distinguished Boston architectural firm of Andrews, Jacques, and Rantoul was commissioned to design the building. The Equitable Society’s decision to hire the firm reinforced the idea that Eastern sophistication had come to Denver. The architects chose the Italian Renaissance Revival style to portray permanence and reliability – a theme echoed throughout the building’s 9-story design. In honor of Equitable, architects designed a floor plan in the shape of a pair of back-to-back Es and specified numerous Es designed into the molding and decoration on the exterior. A new-fangled steel frame became the infrastructure of an amazing 173,000-square-foot structure. It grew to be a building of neo-classical design with rusticated facade Colorado granite on the lower two floors and pale pressed brick on the upper stories some with refined arched windows. Terra cotta ornamentation was laced throughout the facade. The building was crowned by a boxed cornice is supported by elaborate modillions. The decor was magnificent. When you enter, the play of lighting on vaulted ceilings trimmed with Byzantine mosaic lifts ones gaze up. At eye level, Vermont Yellow Marble pillars augment a lobby decorated with additional marble from Tennessee, Italy and France. A grand staircase of that marble and bronze rises to herald four Tiffany stained glass windows. Named The Genius of Insurance, it features Minerva – the Greek goddess of protection – comforting a bereft widow and orphan. The back-to-back E design created deeply recessed courts, enabling every office to have a window for fresh air and natural light while making the building E brand statement. The Equitable Building indeed confirmed that Eastern wealth and prestige had arrived in town. When in opened in 1892, the landmark structure represented a step towards sophistication and prominence, which many people felt Denver desperately needed. So impressive was the edifice that all of the Denver bigwigs leased space. The early tenants list read like a Who’s Who of Denver. Equitable housed the Colorado’s governor’s office until Governor Davis H. Waite moved to the State Capitol Building in 1894. Mining and railroad tycoon David Moffatt opened First National Bank on the ground level, and the Denver & Rio Grande Railroad headquartered here, as did the Colorado Department of the U,.S. Army. The city’s top law firms established a presence and the fifth floor grew to become the region’s largest law library. Mary Lathrop, one of the first two women admitted to the American Bar Association, made her office in the Equitable. As tenancy evolved, the Wall Street of the West vision became reality, the leading stockbrokers built their lairs, and investors came to watch the Equitable Buildings’ ticker tape. Those were heady times. The Silver Panic devastated Denver soon after, and despite its prestigious tenants, lease rates failed to regain their original level until 1902. Modern times have seen the Equitable Buildings adaptive reuse into condominiums. It has been restored to its 1893 grandeur. The National Register landmark is an anchor of the Denver Landmark Preservation Commission’s Downtown Historic District. Which individual took the first steps in establishing Denvers rise as the commercial hub of the Rocky Mountain region? Why did Wall Street businesses want to invest in the West? What did the Equitable Building mean to Denver? 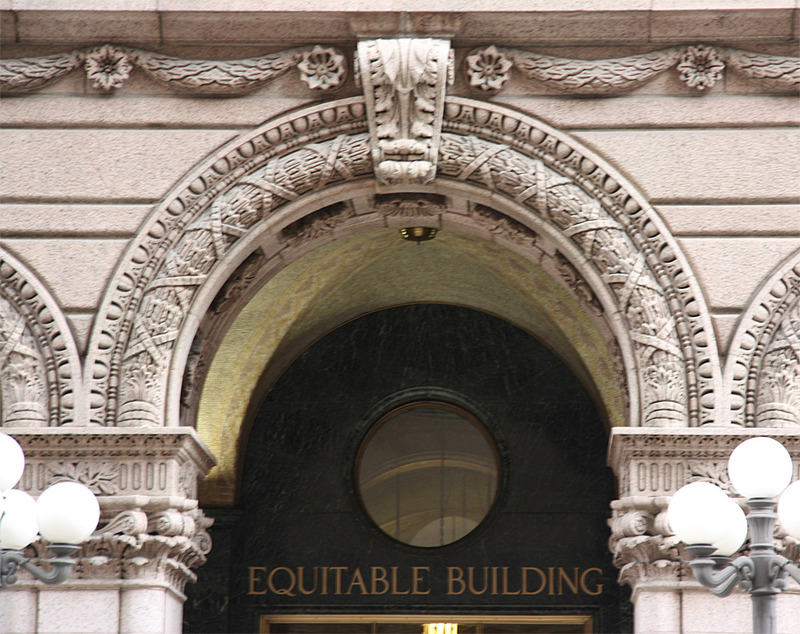 Describe the architectural style of the Equitable building? Once it opened, why did all of Denvers most prominent businesses want to move in to the Equitable Building?